Have you tried the old dodge of shining a light into the sound hole? Doing this in a darkened room will show up the bracing if it's spruce. If cedar, the wood is too dense to be able to see the bracing. I'd forgot about this trick. I'll give it try next time I change strings. Thanks! After performing the torch test I have concluded the top is in fact cedar. Thanks for the tip! I own a Kohno 15 which is powerful deep, clear and beautifully articulated. Also I keep as a "beach" guitar a little jewel, a Yairy Soloist from the early Sixties, the sweetest thing. I am a great admired of these two luthiers. Some lovely Japanese wood in this thread! My own are more modest value-wise, but love each for their specific qualities. The 80's Kasuga has a dark, strident timbre and seems to prefer tuning to E-flat, lovely ebony neck which must be unusual to get on a sub £200 2nd-hand guitar. Top right is a 1974 Takeharu with a very nice solid spruce top, the tone, neck angle and action seems more flamenco negra than classical to me, but it's still labelled as a G120, so who knows what's going on there.....in the foreground is a 1976 Takeharu with a cedar top and a lovely rosewood fretboard. Altogether, I think I paid under £500 for the lot. Hmm that's interesting indeed, perhaps tht's why this one has an ebony fretboard.....surplus Yamaha wood stock? The Shellac changed the colour of the cedar top, it is no longer so "dark". But the surprise was in its new sound. 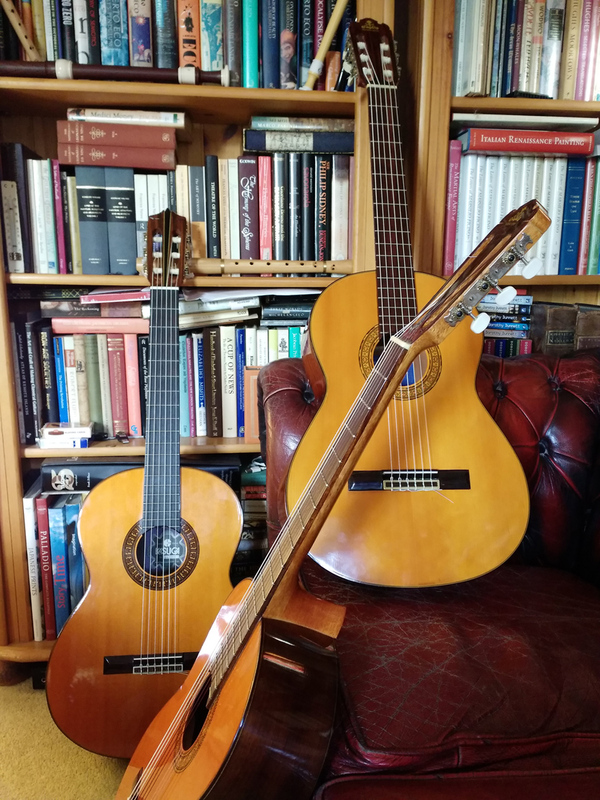 After fitting it with new strings - Knobloch Carbon CX400, High Tension - and playing for a few days the guitar seemed to have "opened" and acquired a new voice, much better than before, crystal clear, more balanced (the strong A is no longer so strong) with a very good separation. I recorded a piece by Sor for another thread in this guitar and you can hear it here . I hope you like it as much as I do. To conclude, I'm so impressed with this "transformation" that I'm seriously considering to do the same with my R. Matsuoka No.40 . May be it keeps its strong voice but the notes will open and separate a little bit more, who knows? Any advice? I had the same experience with refinishing my Takamine C136S with shellac, the change and improvement in the sound was quite amazing. As far as I know Japanese luthiers never used shellac because it would quickly deteriorate in Japan's hot and humid climate. So basically every Japanese guitar has a hidden potential of sound improvement if it gets refinished with shellac. I don't know about other Japanese luthiers, but the Yamaha luthiers started to use shellac on their best instruments in the 1970s and still do today. ... So basically every Japanese guitar has a hidden potential of sound improvement if it gets refinished with shellac. Masaru Kohno actually rated his cashew top finish higher than shellac. Well adapted to Japan's special climate conditions and thus almost every in the world, applied equal thin and maintenance free! IMHO the finish I do like most! It's said that he once received one of his guitars with a shellac refinished top and was so upset that he was not satisfied until being allowed to refinish the guitars top with the original cashew finish. ... but for all the rest I do agree! I would guess that was for export models only, no? In the Japanese catalogue, the specifications for the GC70/70C and GC71 (all of which cannot be exported as they have Brazilian Rosewood back and sides) indicate French Polish Shellac finishes. Last edited by Beowulf on Tue Jan 29, 2019 3:32 pm, edited 1 time in total. It can go both way, for the better or the worse, and it is not really possible to predict this. There is some consensus that in many cases the finish is a part of the instrument and this is often taken into consideration when the instrument is built. Your Matsuoka Nº 40 is allready a very nice instrument and I would not refinsish it, risking turning it worse.